Why not pop into the library to take a look at the Criw Cwl Cymraeg’s new display about why we learn Welsh. Here is a short list of websites that offer links to further information if you are interested in learning Welsh or finding out more about events in the area. We hope you find them of some use. 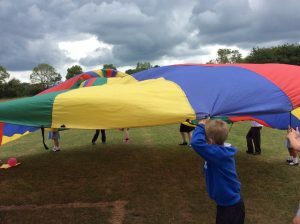 This website is based around programmes for Foundation Phase on S4C. Here you can zoom through space and discover stories, songs and games created especially for young Welsh learners. Bliblob is an animated, talking guide who morphs into the meaning of Welsh words used in the stories and the songs. Bliblob can also be used either with the stories and songs or on its own to learn new words and sentences in a fun way. A site more for juniors to practise vocabulary either words or sentences in a number of different ways. A Welsh Second Language resource for 7-11 year olds in KS2. Llongyfarchiadau Criw Cwl Cymraeg – da iawn. Today we were awarded the Bronze Award of the Language Charter for all our hard work over the year. Diolch to all the Criw and all staff who have made this project a great success. This week we are challenging the children to use a range of the phrases that they have been practising throughout the year. Hopefully we will hear lots of conversations in and around the school to show what we have learnt. 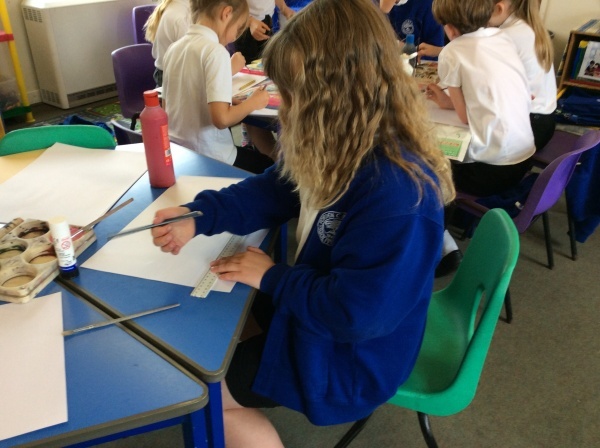 This week’s Seren yr wythnos is Poppy Bevan, class 4. Da iawn Poppy. 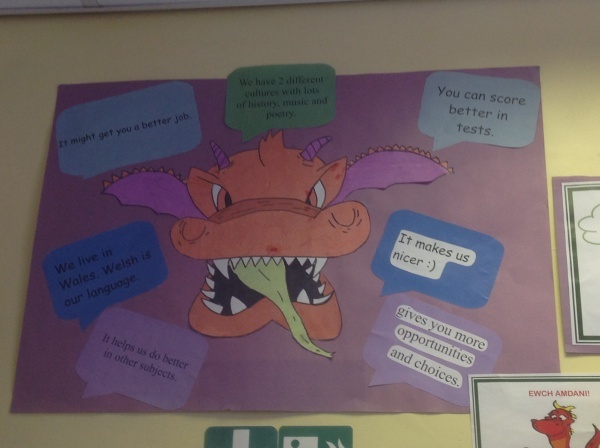 Class 4 have the dragon for the most tickets in their box this week. 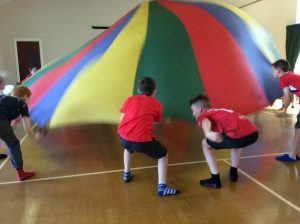 Last week the staff, including lunch time supervisors were joined by Abermule school as they learnt several new playground games to teach the children. Diolch to Nia from Menter Maldwyn for providing the activities. The Criw are gearing up to have their hard work assessed next week to see if they have gained the Bronze Award. Over the year they have organised a range of events, competitions and activities to promote Welsh in the school. Diolch a phob lwc. The Clwb Cinio had their last lunchtime session this week, enjoying the weather with a picnic and parachute games. Diolch am y cacen Mrs Haine. The Criw have been busy encouraging everyone to get to grips with the Dictionary app – much better than other translation services!! Our phrase of the week this week is Dw i’n hoffi dy… (I like your….. ). We suggest children use the phrase to evaluate things like dancing, singing and acting, especially with the school production of Matilda fast approaching. We are hoping that the children will evaluate their own music, art and DT work too. This week’s Seren yr wythnos is Connor Morrison, class 1. Da iawn Connor. Class 1 have the dragon for the most tickets in their box. The juniors have been enjoying their Clwb Cinio. This week they decided to paint using phrases such as Ga i’r paent melyn os gwelwch yn dda? and Cymysgwch melyn a choch am baent oren. Our phrase of the week this week is Llongyfarchiadau! (Congratulations!) A very useful phrase for Sports day next week. This week’s Seren yr wythnos is Florence Howard, class 1. Da iawn Florence. Class 1 have the dragon for the most tickets in their box. Diolch to all the Juniors who designed a logo for the Criw to use. Runners up were Cian, Sam C, Alistair and Matthew. Congratulations to Ben who drew the winning design. We are aiming to use this on posters and fliers next year. Diolch to the Clwb Cinio for icing the Mr Urdd biscuits for the enterprise stall. 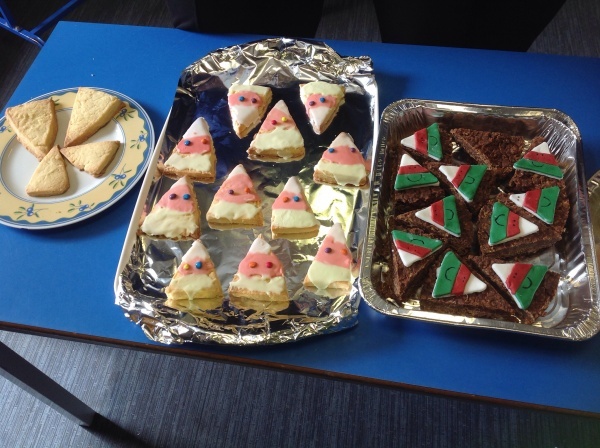 Diolch too to everyone who made cakes and of course to those who bought them. We raised £25. June update – Well done to the Criw Cwl Cymraeg for organising a very successful Welsh afternoon with lots of Welsh activities taking place. Da iawn Ben, who won the logo design competition – his winning design is displayed in the junior cloakroom. 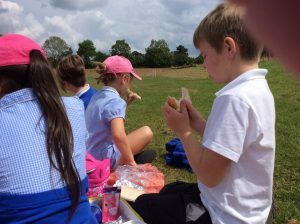 Pawb yn cael hwyl gyda’r parasiwt. May update – The Criw Cymraeg are busy spotting Welsh signs, labels and displays around the school as well as organising activity boxes for wet play times with a number of Welsh items. Many thanks to those who helped raise money at the Christmas Fair for the new Scrabble game and rhyming word jigsaw. They have also planned and created a display to show the importance of learning Welsh and a new graffiti wall for children. Our Criw Cymraeg are a group of 10 children who are planning the school’s actions for the Siarter Iaith. They meet every fortnight to plan what we will do next to meet each target. They decide on a phrase each week, which you can find on our school newsletter, find out which class has been using the most Welsh and choose the star of the week, Seren yr wythnos. Find out what they are up to by reading their posts.